Last Monday, James Comey confirmed that the FBI was investigating possible ties between the Trump campaign and Russian interference in the 2016 election. A little over 24 hours later, the Republican tasked with leading the House investigation into Russian hacking disappeared: Devin Nunes was riding in an Uber with a staffer Tuesday night, when he received a communication on his phone. The House Intelligence Committee chair promptly exited the Uber without explanation. Later that night, Nunes was seen on White House grounds. The following day, Nunes announced that members of the Trump transition team had been legally, incidentally surveilled during the final months of the Obama administration. He did this without consulting his fellow Intelligence Committee members. He proceeded to personally brief the president — an ostensible subject of his House investigation — on the intelligence reports that he had just discovered. There is nothing wrong or even odd about transition officials being incidentally surveilled. America’s intelligence agencies conduct routine surveillance on a wide variety of foreign agents. Transition officials often contact foreign agents. Thus, such officials can end up getting swept up in legal monitoring. Nunes does not question the legality of the intelligence monitoring he came across. But he has suggested that all of the intercepted material was innocuous and of no intelligence value — and, therefore, that the identities of the American citizens intercepted should have been “masked” in intelligence reports. Nunes has implied that the Trump officials had their names unmasked, possibly for nefarious, “deep state” reasons that validate the president’s most paranoid tweets. Even if Nunes’s allegation is true, it is difficult to see why he would evince more concern about an arguable misuse of the NSA’s “unmasking” powers, than about his committee’s investigation into a foreign power’s attempt to undermine our democracy. On Friday, one day after CNN’s report, Nunes abruptly canceled an open hearing scheduled for tomorrow, at which former acting attorney general Sally Yates, former director of National Intelligence James Clapper, and former CIA director John Brennan were all set to testify. The ranking Democrat on the Intelligence Committee was not pleased. The New Yorker’s Ryan Lizza said that his reporting supported Schiff’s view. Nunes essentially blew up the investigation because he realized the scope of what he negotiated with Schiff could actually threaten Trump. 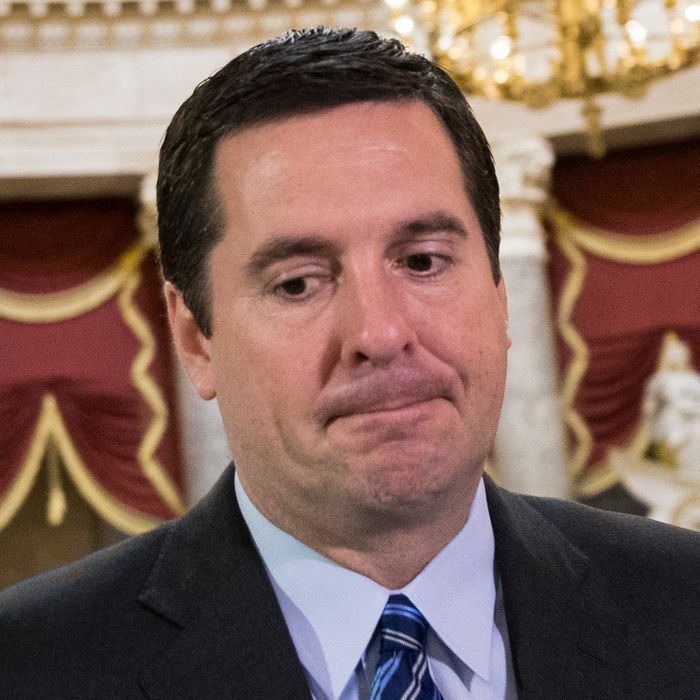 And now, the House Intelligence chair has provided one more reason for the public to think he’s working to undermine his committee’s investigation: On Monday, Nunes admitted that he had been on White House grounds the night before his big disclosure. The House Intelligence Committee has its own secure room in the Capitol, where Nunes reviews classified material on a daily basis. There is no intuitive reason why Nunes would need to go to the White House to securely view his source’s information — unless he wished to keep that information “secure” from his fellow committee members. But why might Nunes want to do that?